Choosing an attorney to represent you for any type of legal matter can be a difficult task; however, when you are choosing an attorney to help you create your estate plan, the need to find the right attorney is heightened. Given the importance of the finished product to you and your loved ones, choosing the right estate planning attorney to assist you is essential. At the Nashua, New Hampshire law firm of DeBruyckere Law Offices we understand the important role your estate plan will play in protecting you, your assets, and your loved ones and we would be honored to work with you on a plan that accomplishes all of your estate planning goals and objectives. Like many New England cities, the City of Nashua, New Hampshire has a long, and interesting, history. Nashua was once part of the area known as Dunstable which was first settled about 1655 as a fur trading town and was part of a 200-square-mile piece of land awarded to Edward Tyng of Dunstable, New England. The modern day city of Nashua, New Hampshire lies in the center of the original 1673 grant. The original area of Dunstable straddled the boundary between Massachusetts and New Hampshire. Consequently, when the governorships of the two provinces were separated, the township of Dunstable was also divided. While part of Dunstable remained in Massachusetts, the town of Dunstable became part of New Hampshire and was incorporated in 1746. It wasn’t until almost a century later that the town of Dunstable became the City of Nashua. Dunstable/Nashua is located where the Nashua and Merrimack rivers meet, making it ripe for development during the Industrial Revolution during which time textile mills operated using water power. By 1836, the Nashua Manufacturing Company had three working cotton mills producing 9.3 million yards of cloth each year. In 1836, Dunstable, New Hampshire was renamed Nashua, after the Nashua River, by a declaration of the New Hampshire legislature. A few years later, in 1842, the town split again in two for 11 years as a result of a dispute between the area north of the Nashua, and the area south of the river. During the time of the split, the northern area which is known today as “French Hill” called itself “Nashville”, while the southern part kept the name Nashua. In 1853 they resolved their differences and collectively charted the “City of Nashua.” During the remainder of the 19th century, the city was a bustling railroad town with no less than six railroad lines that crossed the town and over 50 trains coming and going on a daily basis. The City of Nashua prospered through the first two decades of the 20th century but began a slow decline around the time of the Great Depression. Fortunately for the city, a newly created defense firm, Sanders Associates, moved into one of the many closed mills begin the city in the early 1950s and breathed new life into the area’s stagnant economy. Two decades later, the arrival of Digital Equipment Corp, now Hewlett-Packard, made the city part of the Boston-area high-tech corridor. Located in Southeastern Hillsborough County, New Hampshire, the City of Nashua has a year-around population of just fewer than 90,000 residents, making it the second largest city in the state. In recent decades, Nashua has grown considerably as Boston, Massachusetts continues to expand northward. Nashua has the honor of being the only city to receive the number one ranking twice (1987 and 1997) in Money magazine’s annual “Best Place to Live in America” survey. Nashua has three main commercial districts – Downtown, Amherst Street, and South Nashua Commercial District. Located near the center of the city on Main Street, the Downtown district is the oldest of the commercial districts, featuring commercial, entertainment, and dining venues. Plans are in the works to incorporate the Nashua River into the design of a pedestrian-friendly walkway. Amherst Street is located in the northwestern part of the city with commercial centers along both sides of the roadway. The South Nashua Commercial District, located close to the Massachusetts border, is anchored by the Pheasant Lane Mall and attracts shoppers from across the border who take advantage of the lack of a sales tax in New Hampshire. The city is currently working on developing a mixed commercial and residential development on 26 acres of land off Bridge Street that includes a riverfront location and proximity to downtown, making it an attractive location to live or work. Although the city does not have any professional sports teams at the moment, it has had a series of amateur, semi-professional, and professional baseball teams. The Nashua Silver Knights, part of a summer collegiate league, is the city’s current team. The Spartans Drum and Bugle Corps (1997, 1998, 2004, and 2007 Drum Corps International Division II World Champions) is also based in Nashua. Higher education opportunities are available at six nearby colleges and universities: Daniel Webster College; Nashua Community College; Rivier University; Southern New Hampshire University Nashua campus; Franklin Pierce University Nashua campus; and Granite State College. Nashua has a four-season climate with long, cold, snowy winters, very warm and somewhat humid summers with spring and autumn providing relative brief transitions in between winter and summer. Visitors to Nashua may wish to see the Holocaust Memorial, enjoy Mine Falls Park or plan a day of adventure at SkyVenture indoor skydiving. Residents of Nashua enjoy the city’s historical charm while taking advantage of the convenience of living less than an hour from the Boston metropolitan area as well as the Atlantic coast. At DeBruyckere Law Offices we have developed a law practice that addresses the issues we feel are most important to the people in our community, such as estate planning, because we believe that nothing is more important than providing for loved ones, both now and in the future. 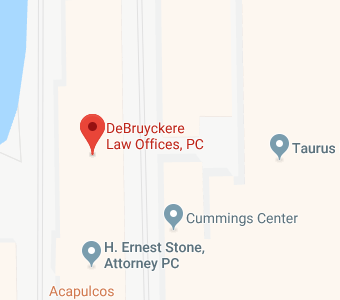 For the attorneys and staff at DeBruyckere Law Offices, our clients are also our friends, neighbors, and families, allowing us to develop ongoing, lasting relationships that facilitate the process of estate planning. Developing lasting relationships with our clients is important because estate planning should be an ongoing process that evolves over time, not something that occurs in a single consultation with an attorney. Moreover, estate planning is a highly personal, and oftentimes sensitive, undertaking, that works best when the client feels comfortable and secure divulging confidential information to his/her attorney. Over the course of your lifetime, your estate planning needs and goals will also change, necessitating changes to your estate plan. Initially, your estate plan may focus exclusively on protecting you and your young family from the financial devastation your unexpected incapacity or death could cause. Events such as marriage, the birth of a child, a significant change in your asset portfolio, and/or your retirement are all events that should trigger a review of your estate plan. Your basic estate plan will likely evolve to include things such as long-term care planning, incapacity planning, Medicaid planning, and probate avoidance. At the Nashua firm of DeBruyckere Law Offices we would be honored to be with you at each step of your journey through life and help you create an estate plan that protects you, your family, and your assets. If you have estate planning questions or concerns, or would like to get started creating your estate plan, contact our experienced Nashua, New Hampshire estate planning attorneys by calling (603) 894-4141.